Peterborough youngster Alfie Baker punched his way to a gold medal at a big international boxing event at the weekend. 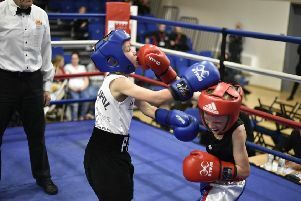 The 11 year-old Peterborough Police Amateur Boxing Club prospect was a winner at the Bristol Box Cup, a tournament which features top fighters in the 11-14 year-old age bracket from all over Europe. Baker came up against Welsh international prospect J. Downey from the Cwmavon ABC in the 55kg final and dominated all three rounds. He displayed fantastic work on the front foot and showed his natural aggression on his long range power shots. In the first round he bombarded Downey with hammering long blows and great hooks to the body. The second round was more of the same with the referee intervening to give Downey a standing eight count after he was shaken by a smashing right power punch. The third round saw Baker really show his class. Working on the front and back foot he caught Downey with ease and towards the end of the round he forced the Welsh lad to take another standing eight count, this time after connecting with a crunching body shot followed by a thumping hook to the head. Downey survived but Baker was an overwhelming points victor. The Peterborough Police club had a second boxer in action at the big event. That was 12 year-old Imraan Shirazi and he boxed E. Wilkinson from Barton Hill ABC in the 35kg final. Wilkinson, the son of former British light-welterweight champion Darren Hamilton, had a considerable height advantage but Shirazi coped well. He worked really well on the inside and was particularly impressive in the second round, finding his way through Wilkinson’s guard to score well with bone-crunching powerful right hands. The final round was close with quality boxing coming from both fighters. Shirazi caught the eye with his smart work on the inside switching from head to body, and Wilkinson picked up points from long range. It was a crowd-pleasing all-action bout and the decision and gold medal went to Wilkinson with Shirazi unluckily having to settle for silver. Peterborough Police ABC head coach Chris Baker said: “This was great experience for both our local fighters who really did show their class in the ring on Sunday.